Larry was born in 1945 to Philip and Mabel Smart. He spent his early years in Baghdad where his father worked for Shell. After returning to England, he went to boarding school and then, in the early 60s, to Croydon Art College, being tutored by amongst others, Bridget Riley. LS was a founder member of Exploding Galaxy, a London project which worked out of a house on the Balls Pond Road, bringing together many artistic people from the hippy generation. In the 60s, following the Beatles interest in Eastern religion and around the time of his graduation from art college, LS began to paint mandalas – decorative « circular figures representing the universe in Hindu and Buddhist symbolism ». He married jazz singer Carol Grimes in 1967 and they soon after had a son, Sam (photograph above shows their wedding day outside Kensington Register Office). LS also started painting portraits of rock icons in the pop art style and produced vibrant paintings of Hendrix, Jagger, Dylan and others. By the early 70s, LS had been invited to Friar Park, the 120 room Henley mansion owned by George Harrison, to paint murals. He worked there for a year. By the mid 70s LS was painting idyllic, period scenes of English country house gardens, filled with fantastic topiary, cricket, tennis or croquet players and large houses. The paintings were again, incredibly vibrant. Like many 60s and early 70s artists, LS painted in acrylics, which gave a whole new colour quality to this era of art. 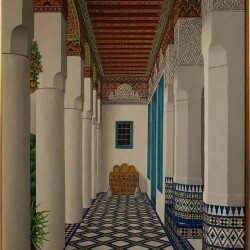 LS re-married, and started to visit Marrakech in Morocco with his new German wife Karen, where he painted the riads (Moroccan villas in traditional architecture) of the wealthy Europeans who holidayed there. He traded art for a stay in a hotel in Tangiers just as he had traded art for vegetarian food in a London cafe a decade earlier. In the 80s and 90s LS painted product labels for his longtime friend, Craig Sams who owned the Whole Earth organic food brand. Despite his association with some of the big guns of 60s and 70s pop culture, LS pretty much lived hand to mouth. 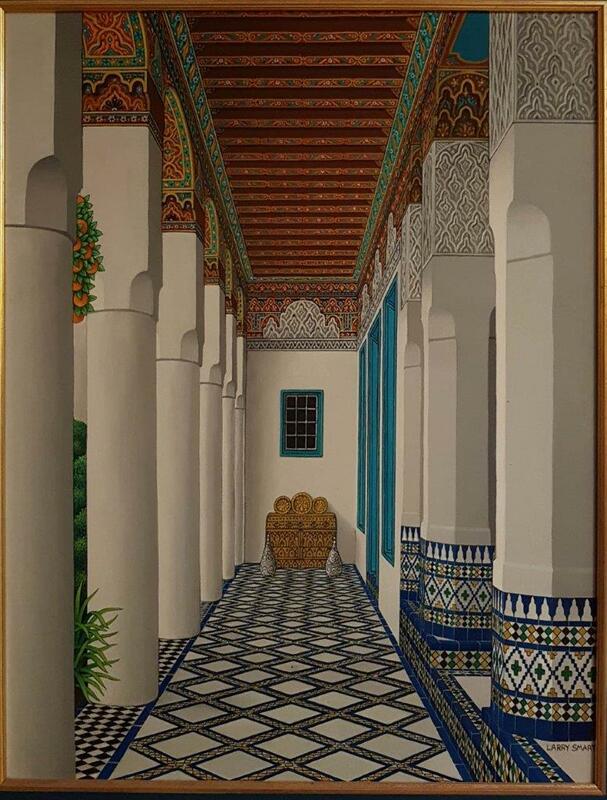 By 2005 he was having copyright worries with a poster publisher, he had health problems (an injured leg from an early car accident and failing eyesight) and his work in Marrakech faltered. Craig Sams has called this chain of events a « perfect storm ». Larry killed himself on the night before his birthday. It was totally unexpected. What LS leaves behind is a truly impressive body of work which weaves its way thro some of the most interesting times and places of modern history. It seems to me that the idealism of his paintings makes him an important contributer to recent English and international art.